Easy and delicious recipes for busy families from the TODAY show's West Coast anchor and host of NBC's Access As the beloved and longtime news anchor and co-host of the TODAY show, current West Coast anchor of the TODAY show, host of Access , and co-host of Access Live , as well as the mother of two young boys, Natalie Morales knows how hard it can be night after night to get a healthful dinner on the table that the whole family will enjoy. Morales was born in Taiwan to a Brazilian mother and Puerto Rican father, and she lived around the world as a child--Panama, Spain, and Brazil. That multicultural experience fed her love for good food, but it's her experience as a working mom that taught her how to cook on the run and keep her recipes healthful. 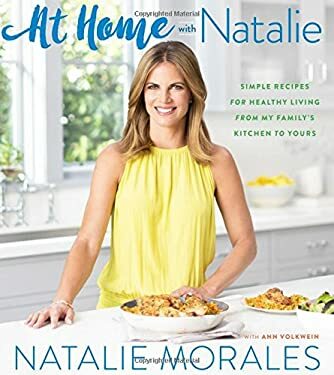 The result is a personal collection of 125 recipes Morales makes at home for her family, including Chicken in Garlic Sauce, Grilled Chimichurri Soy Steak, Sweet and Spicy Slow Roasted Pork, and Pesto Shrimp with Lemon Pepper Fettuccine. New (41 available) BRAND NEW. Over 1.5 million happy customers. 100% money-back guarantee. Make your purchase count: support Better World Books' worldwide literacy partners.